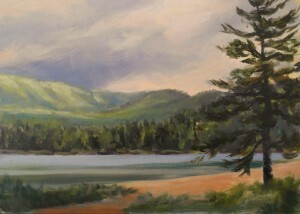 North South Lake is one of my favorite places to paint under adverse conditions. Big cloud formations over the lake, areas of breaking light reflecting in the water, and places one can get quick shelter from the elements, are among the reasons why I like it here so much. In this case, a pavilion overlooking North Lake provided shelter while painting this scene of storm clouds coming and going. The beach area quickly emptied, and I watched the distant mountaintop glow with light as the rain moved away and sunlight broke through the cloud cover. It was Catskill drama at its very best! North South Lake is one of the sites along the Hudson River School Art Trail. It was frequently painted by Thomas Cole, Frederic Church, Jasper Cropsy, and other artists of the time. The Catskill Mountain House was situated just east of the lake, and became a favorite destination for vacationers from New York City, who would journey up the Hudson River by steamboat to get here and enjoy the cool mountain breezes, long vistas, and recreational activities. 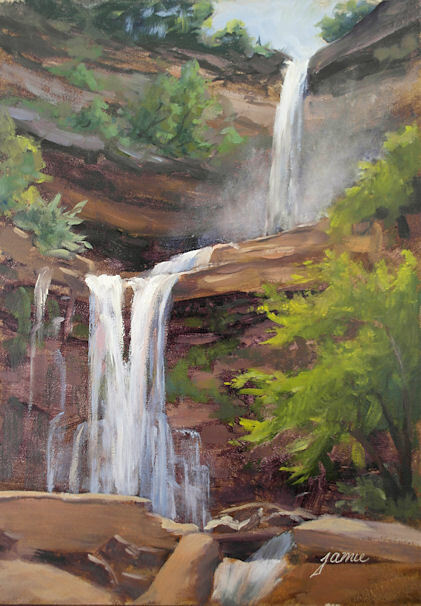 This was painted on location, at the famous Hudson River School site, Kaaterskill Falls. It was a sticky, hot morning and a long climb up to the base of the falls with a backpack of painting gear, but well worth it to see the sunlight come up over the mountain and hit the falls in a stream of bright light, illuminating the mist at the midlevel basin. I never get tired of painting this scene and area. There is so much to paint along the waterfalls and streams on the way up the trail, that I sometimes end up painting one of the less famous views en route to Kaaterskill Falls.